Coesam Organic Rosehip FiberPlus is a unique food supplement that helps against arthritis and inflammation. It strengthens the immune system in dogs, small animals (cats, rodents , etc. ) as well as horses. 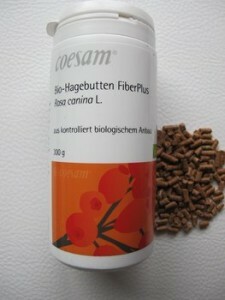 Coesam organic rosehip FiberPlus contains the best of the fruit shell and seeds of the AP – 4 Rosehip. It is an excellent source of antioxidants such as vitamin C , beta-carotene and galactolipids. By combining rosehip powder and rosehip seeds we get this pellet with low starch and sugar content but with a high, natural content of calcium and phosphorus (ratio 2.7 : 1). The high fiber content allows a sustainable release of energy. for horses, dogs, pets as for ex. cats and rodents. 10 % Coesam Rosehip powder* 90 % Coesam Rosehip seeds* (*from controlled organic farming) The pellets are grain-free and cold-pressed.